I am delighted to have Sydney Lea as our guest today. Sydney Lea is the Poet Laureate of Vermont. 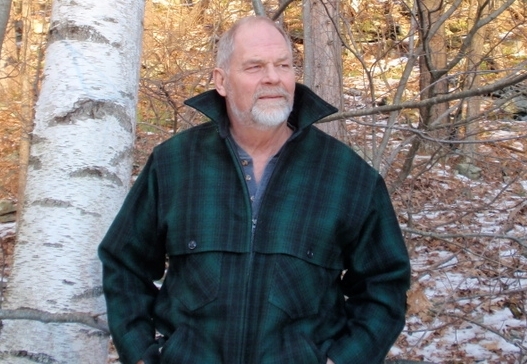 Retired after 43 years of college teaching, he is active in literacy and conservation efforts in northern New England. He founded the New England Review in 1977 and edited it until 1989. He has published ten volumes of poetry, most recently I Was Thinking of Beauty (Four Way Books, 2013) and Six Sundays Toward a Seventh (Wipf and Stock, 2012). He has also published a novel, a selection of literary essays, and three collections of naturalist essays. He is the recipient of fellowships from the MacArthur, Rockefeller, and Fulbright Foundations. 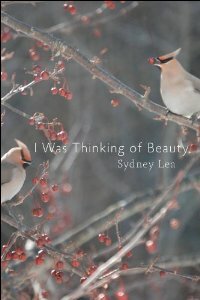 Today's poem comes from I Was Thinking of Beauty. Tommy the logger's teenaged son. I needed distraction, so we took that hike together. Toward evening a doe crashed past, haphazard. the pall of coma. Our old car had flipped. how could the doe survive the coming cold? the Jeep had landed roof-down on Route 4. Not up to us to spare her, he drawled. scourged bloody by lashes of brush in her scrabbling circles. my soul for this—or anything. So I thought as I felt my uselessness in the scene. What could I say? What could I do? what had happened or how. Words wouldn't help them. To see that so starkly stung. a student now, much less a daughter or son? DL: The form of this poem strikes me as a happy marriage between tradition and invention. Tell us how the form evolved. SL: I recently colluded with the Vermont Contemporary Music Ensemble in a concert; five composers wrote individual pieces that were responses to poems of mine. One of the composers, Erik Nielsen, said that “the hardest part about composition is talking about it.” I identify with such a contention. That said, I have some intuitive answer to your question about form—intuitive because, vague as this inexcusably is, there seems a way in which forms choose me rather than vice versa. More or less strict forms, however unconventional (I rarely use received conventions), are enabling components for me. If I allow myself to play with formal alternatives, I can get away from thinking too hard about what I may “mean.” Paradoxically, that approach allows for such meaning—though I mistrust that term—the poem may contain. Mind you, I didn’t know that would be a line at all, let alone the last; I was, as it were, led there, past “black birds in the trees,” through “my vapid dream,” and so on. The form was built around that “inspired” keystone. DL: I deeply admire the wonderful, subtle sounds of your poem. There's some end rhyme, yes, but then there are also rhymes and near rhymes scattered throughout the poem, e.g., old, cold, bold; called, quarreled, drawled; preened, scene, dream. How did you make this music happen? SL: My late friend Bill Matthews, who was not a formalist like me, once told me in conversation that he tended to like free verse when it sounded most like formal, and vice versa. Me too: hence the ongoing appeal to me of slant rhyme. And there is my ongoing obeisance to Frost, who, though far stricter in his formal allegiances than I am (or could be), nonetheless wanted the sound of conversation in his poems. I guess the looseness of my rhyming somehow goes in service of that aim. DL: Your poem skillfully handles two narratives: the frame with the speaker in the woods and then the inner story about the argument with the wife that led to her accident. How did you go about fusing these two pieces? Were they always in the same poem? Do you consider one or the other the more important story? SL: From the start, they were one and the same story, the understandably complex tale of the moment(s) I recalled. There was no narrative engineering involved. My wife was near death; I was on a hike with two others who were close to her; I was at the very awkward and daunting dawn of what would be a long professorial career; a blind deer showed up; I felt...what I felt. I just tried to get all that onto the page as straightforwardly as I could, trusting that honest recollection would have its own “poetry.” I always operate on that trust, in fact. DL: Chekov said, "If you want to move your reader, write more coldly." I couldn't help thinking of those words as I read and reread your poem. The tone is so chilly but the poem is all the more effective because of that chilliness. How did you manage to keep out emotionalism and just let the details and images do their work. SL: Well, I have always assumed that gushy sentimentality gets in the way of real sentiment. Once again, straightforward—even “cold”—recitation would carry the emotional freight I needed to make the poem other than a whine. DL: There's irony in that the speaker who makes his living reading books and talking becomes "mute," then "speechless," and asks at the end, "What could I say?" He learns that there are "unspeakable things." It's also ironic that the professor gets schooled by the logger. Did the irony come into the poem inadvertently or was it crafted? SL: What I have always admired in the Yankee old-timer is his or her capacity to know the difference between acceptance and resignation. The old-timer I refer to (and I have lost touch with his son, a sort of bridge figure between his dad’s emotional makeup and my own) is gone now; but as he once said, “If you can’t fix something, you get along with it.” He had had a far more dangerous and at times tragic life than mine, and I am sure, as he was a very bright guy, he often wanted to say something about the unsayable; but because it was just that, he kept his counsel. I have never attained that height of philosophic thinking, but his is the sort of model I imagine when I find myself, or find another writer, too lavishly singing the area in the opera called MeMeMe. DL: I sense the ghost of Robert Frost in this poem. And although you do not name the setting, it feels like New England. What role, if any, have Frost and New England played in this poem? SL: Yes, virtually all my poems are set in my home territory, New England north of Boston. There is no time spent in these villages and fields and woods that does not cause one, if he or she is a poet, and no matter what his or her taste and practices may be, to bring Frost to mind. Frost is not, maybe, my favorite poet, but he is surely the most influential on me. ; Harold Bloom would imagine some “anxiety of influence,” then, on my part; but I feel, rather, real gratitude to this mentor: he has opened my eyes to things that my own (comparatively) weak eyes wouldn’t have caught. Readers, please enjoy listening to Sydney Lea read "Blind, Dumb." I first met Wisconsin poet Karla Huston online in a poetry listserv we both belong to. 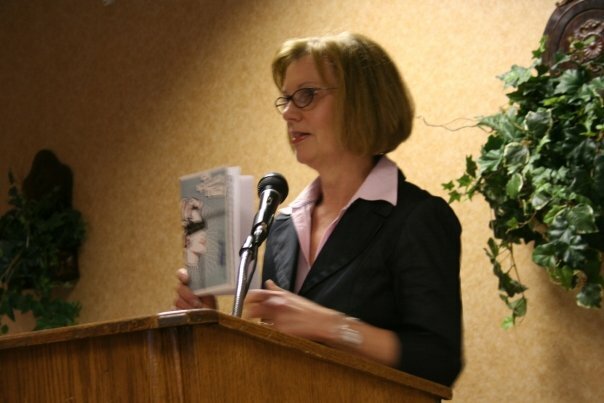 I later had the pleasure of meeting her at the 2006 Dodge Poetry Festival. We've met at each festival since that first meeting. I feel particularly excited about hosting this salon for Karla's first full-length collection as I had an opportunity to read and critique it a few years before it found a publisher. Although A Theory of Lipstick is Karla's first full-length collection, she has previously published six chapbooks. Let's hear what Karla has to say about her book. 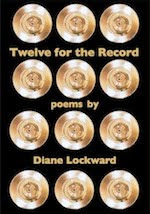 Diane: Tell us how you went about writing these poems and assembling them into a collection. I also depended on the kindness of friends, especially Diane Lockward, who offered to take a look, finally giving the book sense and shape. Her suggestions were invaluable. After it lingered for another couple of years, I finally took a new look, took courage and sent it to Scott Douglass, editor and publisher of Main Street Rag Publishing. Because I’d won his 2003 chapbook contest, he agreed to read it. To my great pleasure, he accepted it and suddenly, I had a book contract in my hands. 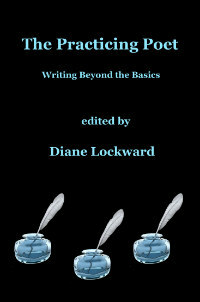 Diane: Tell us the story behind your cover. Karla: The cover art was a simple matter of Googling images with lipstick; the art of German artist Christine Dumbsky came up in the queue. She loves poetry and was pleased to work with me. 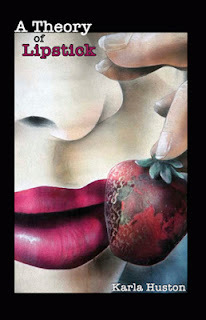 What I appreciate most about the cover is the image of the world painted inside the strawberry. Diane: How did you select the title for your book? Karla: The book should have been called Still Waiting for as long as sat in a drawer. But Chuck Rybak, UW Green Bay professor and friend, suggested the title from a poem in the manuscript. The poem, “Theory of Lipstick,” was a Pushcart Prize winner in 2011. I have several poems about lipstick in the manuscript so Chuck’s suggestion was perfect. Diane: What do you hope readers will take away from your book? Karla: A Theory of Lipstick is about desire, about pop culture, about women and aging—dog catcher’s wives, mothers, women looking out windows. It’s about junk drawers and birds. It’s also about having fun with language and sound, about play. I hope readers resonate with the poems and images. Diane: Please choose a favorite poem for us and, if you like, tell us why you chose this one. Karla: Perhaps one of the most difficult poems to read aloud because it’s so easy to get tongue-tangled, “Theory of Lipstick” was also a lot of fun to write. I have a lovely book on the history of lipstick; I researched lipstick colors and kinds (gloss, pot rouge, lip liner, the whole genre of lipsticks meant to plump lips, make them bee stung). I was fascinated by the fact that during World War II, women could afford little else but a new tube of lipstick. I had a very good time putting this together—one line, one image, one mouthful at a time. your gilded rose bud bluster is weapon and wine. pucker up gelato: every pink signal is a warning. Now let's gather around and listen to Karla read "Theory of Lipstick." Please join us for Karla's book salon reception. Enjoy some beautiful fresh strawberries, a margarita, and some delicious guacamole with crackers. Before you head for home, please get yourself a copy of Karla's book. And feel free to leave her a comment or a question in the comments section. Thanks for coming! In each of my monthly Poetry Newsletters, I include a book recommendation. The books I choose are always in some way related to poetry. The featured book might be a craft book or it might be a memoir. Or it might be a book that's related to art in general but which applies to poetry. I don't usually repost those recommendations here. However, the May book brought forth a number of emails from subscribers who thanked me for the title, said they hadn't heard of the book, but had then ordered it and were glad they had. So I thought I'd let my blog readers also know about the May book. I love literary memoirs, especially ones by poets. 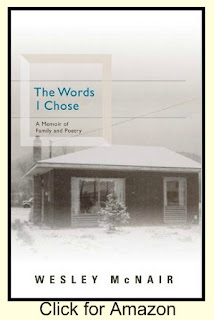 Wesley McNair's The Words I Chose: A Memoir of Family and Poetry immediately went to the top of my list of favorites. In 175 pages, McNair covers his life from childhood to the current time. He is able to do this because he limits his focus to his growth as a poet. Of course, there are parts about his personal life—his difficult parents, his happy marriage to a woman with two sons—but he always returns to the writing life and how those other areas affected his development as a poet. Each chapter begins with a poem of his and then covers a phase of his life. McNair pays tribute to the people who early on responded to his poems and sent him books. He covers the dark days, lonely ones, times of bone-crushing financial deprivation. For many years he was confronted with the problems of how to support a family, get an advanced degree, find time for poetry, and earn enough to live on. But he did it, always mindful of how all of that was laying the groundwork for poetry, how even the environment in which he lived was turning him into a narrative poet with a strong New England influence. Looking back on his life, he understands that all of the events and deprivations of his past contributed to his "transformation into an artist," that he was being "toughened…for the rounds of rejections…that are common to the writing life…," and that he was being given "a kind of gift, a source of [his] artistic development." He traveled a long and arduous journey, but one that led to being named the current Poet Laureate of Maine. I previously wrote about Girl Talk, an event I ran at my local library on Saturday, March 16. This year marked the sixth year in a row for the event. In my earlier post I described how the event is organized and detailed the work that goes into putting it together. I hoped then, and now, that someone out there might be inspired to run a similar event next March. Each year, following the event, I have used the photos for a video. Here's this year's version. Enjoy with some popcorn.